3-Wilhelmina Young was born on 4 Sep 1867 in Longford, Tasmania and died on 27 Mar 1953 in Ulverstone, Tasmania at age 85. 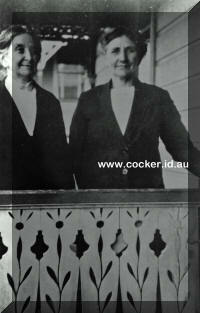 Wilhemina, or Minnie as she was known (right), and her sister Elizabeth May McHugh (left). Last Thursday Miss Williaminia [sic] Young, Victoria street, Ulverstone, who for nearly five months has been a patient at the Devon Hospital, Latrobe and Ulverstone General Hospital following a fall in her garden, was able to return home to celebrate her 85th birthday. Her cosy room was a bower of spring flowers brought by friends, who also presented gifts. Choice flowers were flown from Melbourne, and telegrams came from well-wishers on the mainland and, various parts of Tasmania. A bouquet was presented by the matron and stall of Ulverstone Hospital. Miss Fay Young, as hostess, was assisted by Mesdames R. J. Colhoun and J. B. Allen in serving tea. Among those who "dropped in" to express good wishes were a niece, Mrs. L. Harvey (Launceston), who motored to the North-West Coast with her daughter, Mary Harvey, and the latter's fiancé, Mr. Dexter Cocker, of Launceston: Mrs. E. J. Atkins; Red Cross visitors, Mesdames H. L. Dodery and A. J Collins: Miss Jean Viney, matron of Ulverstone Hospital, with Mrs. Viney (Launceston): Mrs. G. Miller and daughters, Mrs. Arch Kimberley, with Mrs. Kimberley, sen.: Mrs. B. Jordan, with son-in-law and daughter Vida (the Bruce Mahoneys) : Mesdames N. Hawkins. W. T. James, Hedley Stubbs, Tom Gardiner and H. Ayton; Misses E. and D. Nichols. D. Murray and M. Chamberlain: and Master Billie Marshall. 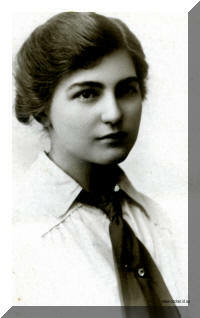 Wilhelmina had one daughter: Fredericka Howard Rogers (Fay). 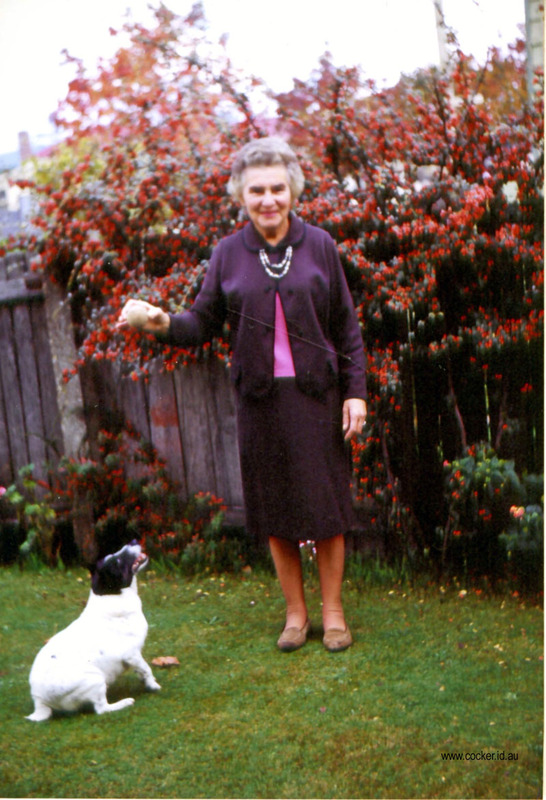 4-Fredericka Howard Rogers (Fay) Young was born on 10 Feb 1897 in Ulverstone, Tasmania and died on 21 Aug 1974 in Ulverstone, Tasmania at age 77. Fay lived her whole life in the 34 Victoria Street Cottage opposite the Salvation Army Hall owned by her grandfather William, along with her mother Minnie and Uncle John. She was greatly loved by her wider family and was a much respected member of the community. She was a lady of great courage, determination and enormous energy. 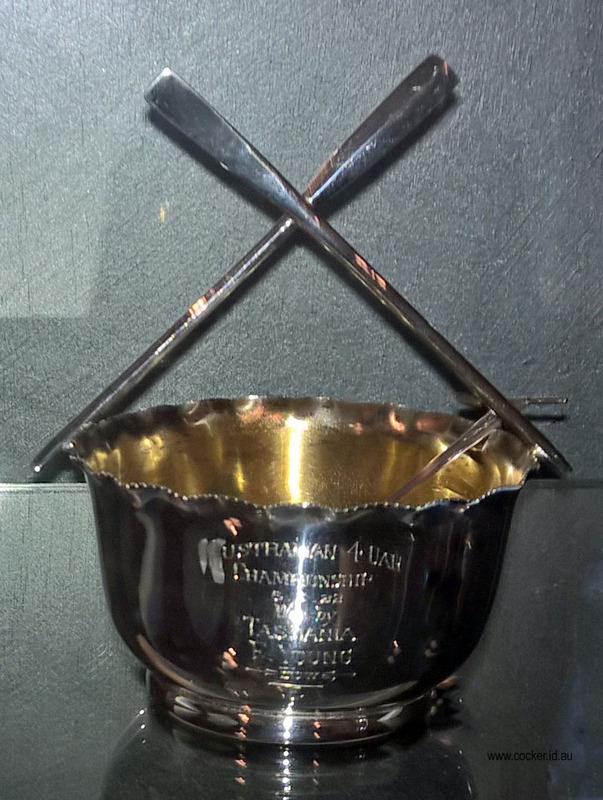 On 16 May 2015 Fay's prize sugar bowl and her original scarf and badges were presented to the Ulverstone Rowing Club where they now remain on permanent display in remembrance of Fay and as an inspiration to todays rowers. The Club also produced a photo book in her memory. 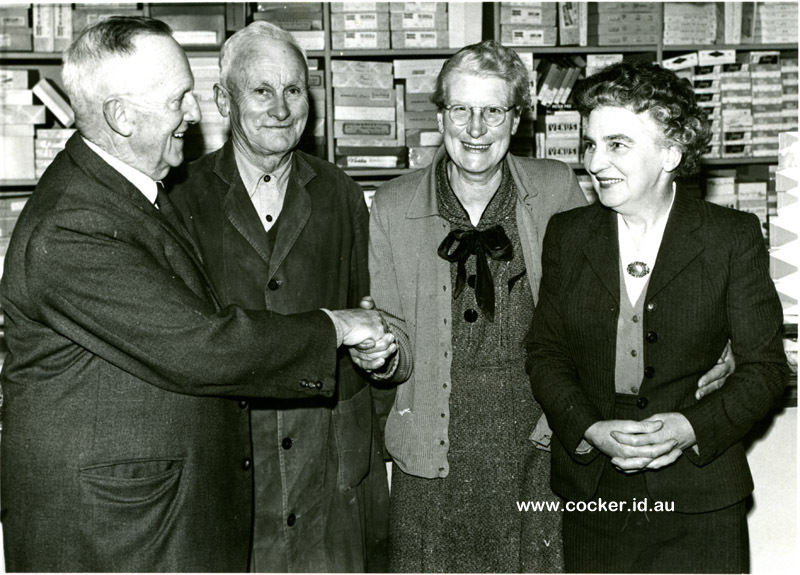 In 1932 Fay started work for G. and A. Ellis Pty Ltd in Reiby Street which opened in 1876 and was, until taken over by G J Coles in the early 1970’s, the main department store in Ulverstone. She rose to be the buyer and Showroom department head. 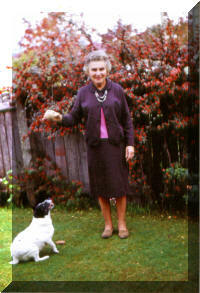 She is pictured here from the Burnie Advocate in 1961 as one of the store’s longest serving employees. She lived all her life in her family home in Victoria Street which she bequested to the Clarendon Children’s home at Kingston Beach, Hobart to support their work in conducting their Home of Mercy. Her family home has since been demolished to make way for civic buildings. Fay had an affinity with animals, no doubt cultivated by her grandfather who was a Scottish farm labourer. 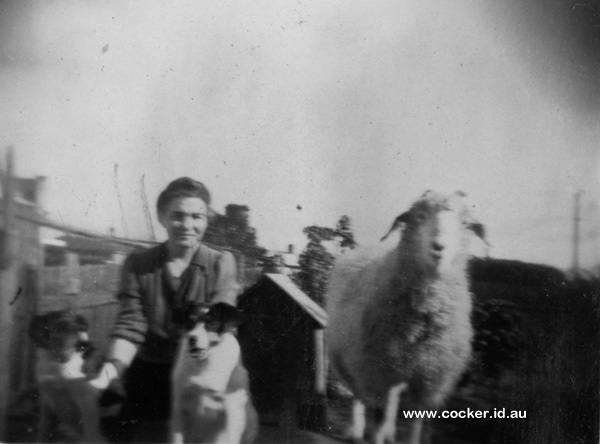 She loved her dogs and her bantams and her goat. On Wednesday 21 August 1974 Fay went for a walk and called in on a friend. She suddenly felt unwell and asked if she could lie down. She passed away shortly thereafter. The home-coming of the Ulverstone ladies' inter-State champion crew was without doubt an. inspiring event to the young girls chosen to represent the State of Tasmania on the historic waters of the Parramatta, when the greatest oarsmen of the world have met and competed for the honor of their homeland. The news of their victory was received at Ulverstone with delight, and in scone quarters with a certain amount of doubt when the un­suitability of their boat was taken into consideration. However, to win un­der such disabilities adds to the merit of their success. At a public meeting held in the Ulverstone Town Hall, and presided over by Warden Lakin, it was arranged to give them a civic recep­tion on arrival of the early train yes­terday morning. The attendance of the people was no doubt most gratifying to the champions, the platform being densely, packed with a cheering crowd, and which extended to the street. Among the crowd were a number of Girl Guides, of which organisation Mrs. J. R. Robinson has control. As the train steamed into the station the Ulverstone Band, under Band-­master H, Gooding, played “Home, Sweet Home," and "See the Conquer­ing Hero Comes." On emerging from the station a halt was made and the Warden, on behalf of the people of Ulverstone, extended to the crew-­Mrs. 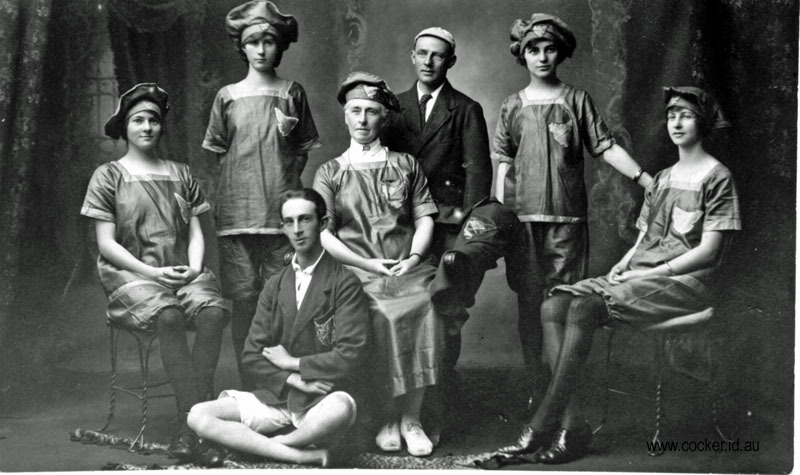 J. H. Robinson (manageress), Misses Young, Anderson, Parsons and Shelton, Messrs. R. Dutton (coach) and E. Websdale (cox.) - a warm greeting to their home. He said they were met at that early hour to congratulate them upon their great victory on Saturday last at Sydney. The people were both surprised and pleased when the crews arrived that the crew were the champion ladies crew of the Commonwealth of Australia. The unsuitable character of their boat for such an im­portant contest was recognised here, and no surprise would have been felt had they failed to beat their opponents. This was the only thing that was like­ly to cause failure; certainly not want of pluck. Various rumors came to hand which were more or less reliable; mostly less. He could assure them that when the news of their victory was confirmed the people of Ulverstone were delighted, this feeling being accentuated by the fact that they be­longed to Ulverstone. (Cheers). He desired to convey to them on behalf of the people a cordial welcome home, and gave them an invitation to a social evening in the Oddfellows' Hall to­night. The Warden apologised for the absence of the Hon. H. A. Nichols, M.L.C., who was suffering from a severe cold. Cheers for the crew brought the ceremony to a close, the crew being motored to their respective homes. Mrs. J. R. Robinson, who went with the crew as manageress, has in many ways assisted to make aquatic matters at Ulverstone a popular form of recreation, and is also largely responsible for the honor that has come to Ulverstone through the victorious crew. 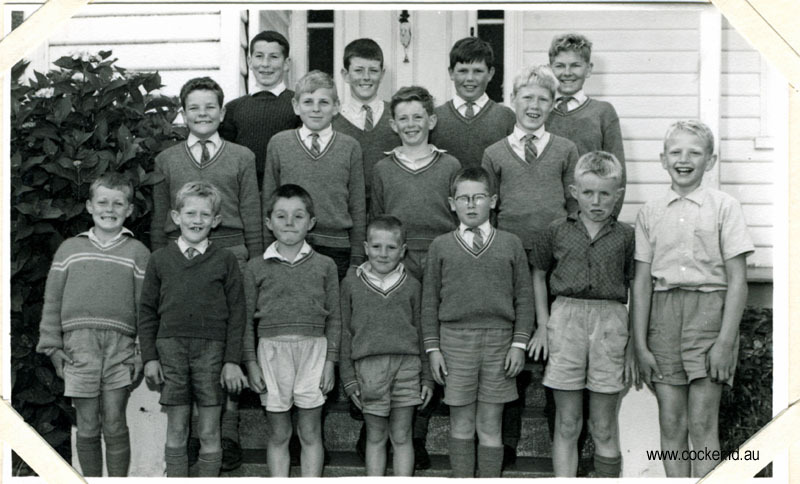 Mr. Dutton was their coach, and his care­ful tuition was no doubt a powerful factor in bringing victory to Tasmania. His presence in Sydney, and his per­sistent declaration that Tasmania would through the crew, infused into his charge the necessary encouragement and they went to the post full of hope. Mr E. Websdale (coxswain) received a word of praise for the way he took them along the course. Not an unnecessary yard was pulled. This is also a most important feature in any contest and he served them well. At last the eventful day arrived and we motored down to the scene of ac­tion, confident that the crew would put up a great fight for Tasmania. We were last boat away from the skids. Everyone was remarking, "What light little girls. Their big boat, too! They are marvels if they win," etc. Those watching on the bank were anxious as the crews lined up to the start. "They're off" is the cry. Who is lead­ing? Tasmania was left behind in the first 100 yards with Queensland, S. Australia and New South Wales leading in that order. Tasmania was 11 lengths last when 300 yards had been covered, but were creeping up a little closer. Tassie's stroke here made an ef­fort and picked up half a length and held on to it. Here a launch gave Tassie and South Australia the wash, causing a little ruggedness in the row­ing. Queensland floundered here, and Tassie were called on again for “six," which when given made them only half a length behind South Australia; with Queensland and New South Wales fighting it out a length in the rear. Here Tasmania spurted again and got a couple of feet advantage when the stroke came off the slide; but with a coolness that was wonderful she stayed on the runners for three strokes, when she got back again. By this time South Australia were again level, but calling on her crew for a dozen, Tasmania came away and won by eight feet, amidst intense excitement, hundreds of Tasmanians being on the point at the finish. When one realizes that the average weight of the Ulverstone crew was 7st. 10¼lb of South Australia 9st. 11lb, of New South Wales, 10st 3lb , and of Queensland 10st, it is brought home to those interested that, it was a wonderful performance to race in an tub practice four against racing boats, with such a difference in weight to­gether with the long trip over; and then to succeed in rowing down by sheer grit, determination and combina­tion the other crews is feat worthy of Tasmania and a credit to the crew. The reception they received at the hands of the people after the race will never be forgotten by them, and the corner of Tassie on the shore gave them a deafening cheer. 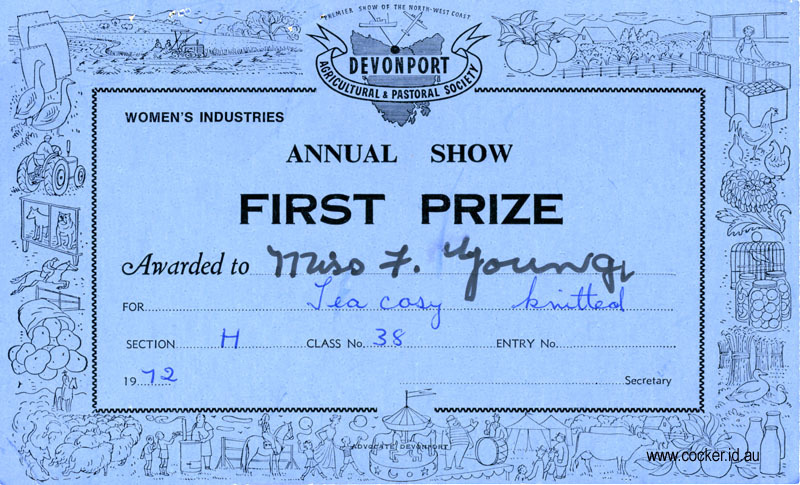 The crew were presented with the trophies won, which are beautiful sugar bowls with crossed looms, and the inscription: Interstate four oar-oared champion. Won by Tasmania.